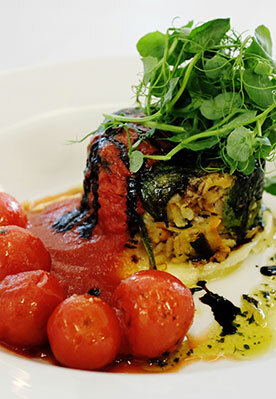 Cumberland herb pudding, nettle scented dauphinoise potatoes, cherry tomato compote, fresh pesto and balsamic syrup. This recipe was devised by Christopher Bridge, 2013 Gluten-free Chef of the Year finalist. Boil the rice until almost cooked then add the jumbo oats. Cook until the oats are cooked but still al dente. Put to one side. In a separate pan, sauté the vegetables in a little butter until soft and tender. Add the rice and oat mix and stir through fully to incorporate. Season to taste. Beat the egg and stir fully through the mixture. Line a ramekin with melted butter and the spinach leaves then pack the mixture in. Seal the top of the ramekin with paper and foil and bake at gas mark 5 for 20 minutes. For the cherry tomato compote, heat a small amount of vegetable oil in a wok to smoke point. Add cherry tomatoes and sear, then add the basil and wine and simmer, reducing the wine by half. Thicken with tomato paste, seasoning as required. For the nettle dauphinoise, line a small dish with sliced potatoes, layering with nettle jelly and seasoning. Build up the layers three or four high. Mix the garlic and cream and pour over the potatoes, covering completely. Cover with foil and bake at gas mark 5 for 45 minutes.